In the first championship matchup of the day, the No. 1 seeded Twinfield Trojans attempted to complete a near perfect season. Unfortunately for the Plainfield school, it was far from nearly perfect against the defending champion Proctor Phantoms Saturday. 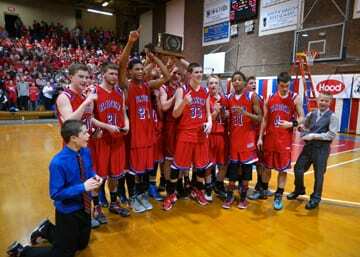 Despite holding Proctor to 22 percent shooting from the field, Twinfield’s own shooting woes and untimely turnovers for the first three quarters allowed the Phantoms to escape with a 32-30 victory, securing their second straight Division IV high school boys basketball state title at the Barre Auditorium. After Nick Ojala drained a 3-pointer to open the fourth quarter and extended Proctor’s lead to a game-high 11 points, Twinfield mounted a valiant comeback. Twinfield’s Jordan Moore cut the deficit back down to single digits with his own 3-pointer, and a Moore free throw made it a 28-21 game. Approaching the four-minute mark of the fourth quarter, Chase Ivey dropped in a runner, leaving Twinfield trailing 28-23. The Trojans couldn’t add on to their 6-0 run initially, missing shots on back-to-back trips down the floor. However, Kris Utton picked a good time to sink his first shot of the game, making it a one-possession ball game with under three minutes to go in the contest. On Proctor’s ensuing possession, Matt Codling swiped a steal and went coast to coast for a layup, closing the gap to 28-27 with 1:41 on the clock, forcing a Proctor timeout. The timeout didn’t stop the bleeding for the Phantoms. Ivey came up with two blocked shots on defense, and the Trojans took over. Following a missed shot, Codling pulled down an offensive rebound and was fouled with 52.8 seconds left in the game. He made both free throws, handing Twinfield its first advantage of the game, 29-28. The lead didn’t last long as Ojala drove to the basket and his layup ended a 12-0 spurt by Twinfield. It was also the second and last Proctor field goal in the fourth quarter, but it was all it needed. The two teams traded free throws for a 31-30 Phantom lead with 3 seconds to play. Proctor senior Nick Swane was fouled on an inbounds play. With 2 seconds left, he made the first free throw of a double bonus, but missed the second. Moore grabbed the rebound, but was forced to try a full-court prayer that went unanswered. Moore led all scorers with 11 points. Codling chipped in with 9 second-half points for Twinfield, which fell to 21-2 on the season. Gannon McKearin paced Proctor (21-3) with 8 points. Four other players had six to round out the scoring for the Phantoms, who won their eighth Division IV state championship. Scoring was at a premium throughout most of the game. The two teams played to an 11-9 Proctor halftime lead, the lowest scoring first half in Barre Auditorium history. In the late championship game, offense was not an issue for Hazen Union. For one quarter, it looked like the Hardwick school would suffer the same fate as the Blue Devils’ opponents in the last four state championship matchups. However, the Wildcats made sure the Division III state championship trophy would be headed to Caledonia County this year by holding Williamstown to just a single free throw in the second quarter, using a 10-1 run to take a 22-16 lead into halftime. Hazen outscored Williamstown 51-28 after the first quarter. Hazen (22-2) kept on rolling in the second half. The Wildcats enjoyed a 40-29 advantage after three quarters and were sitting pretty in a bonus situation for the final 8 minutes of the game. The free-throw line played a key role in Hazen’s victory as the No. 4 seeded Wildcats went 17-of-22 from the charity stripe in the fourth quarter. Kevin Doyon was a thorn in Williamstown’s side all night, pouring in a game-high 21 points, including a trio of 3-pointers. Denis Lecours was 6-for-8 down the stretch from the charity stripe and finished with 16 points to prevent any hopes of a Blue Devil comeback. Ben Bristow paced Williamstown with 10 points in the losing cause. Williamstown, the four-time defending state champions, concluded what was expected to be a rebuilding season with a 21-3 record.